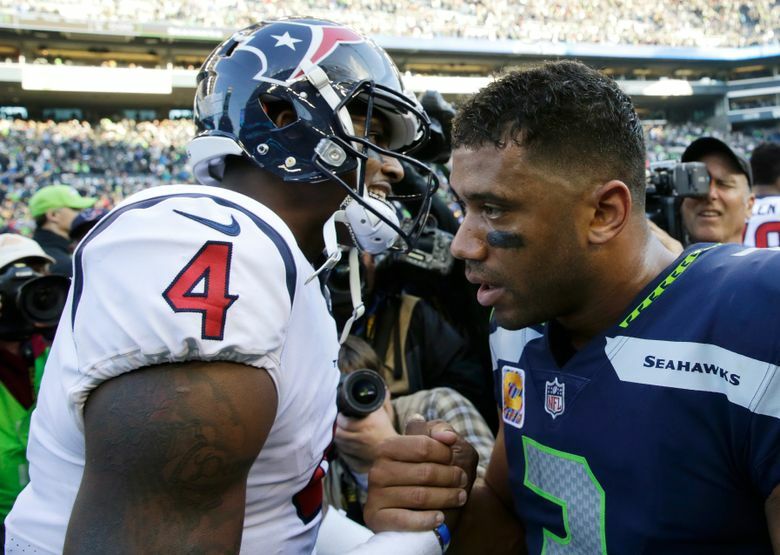 Seahawks players were stunned at the news Thursday that Houston quarterback Deshaun Watson had suffered a season-ending knee injury. The Seahawks’ defense walked away as impressed with Deshaun Watson Sunday as any quarterback they had seen play at CenturyLink Field in years. And that only added to their shock at hearing on Thursday that Watson had reportedly suffered an ACL tear in practice and could be lost for the season. With 8 picks left in the NFL draft, what does history show the Seahawks might get? Word began to leak into the Seattle locker room just before the Seahawks took the field for their Thursday practice. Other Seahawks took to social media to react, some doing so after practice with the news breaking right as Seattle was preparing for its workout Thursday. Seattle defensive lineman Frank Clark also took to Twitter to send out a similar sentiment. “Damn man, helluva competitor! I spoke highly of you my dog!! Let’s pray for the best,” Clark tweeted. Watson threw for 402 yards in Seattle’s eventual 41-38 win over the Texans on Sunday, which while not an opponent record — Ben Roethlisberger of Pittsburgh threw for 456 at CenturyLink in 2015 — was among the most impressive games by a QB against the Legion of Boom.